Our team study group continues to meet weekly to explore the Community of Inquiry framework. As mentioned last week, we have all read Randy Garrison’s 2011 Second Edition of E-Learning in the Twenty-First Century. Garrison asserts in his book that the framework has been researched enough to be called a theoretical framework. We are still pushing back a bit on that, but reviewing the literature is interesting. We have a collective Zotero library on CoI with some 17 articles to date (most contributed by our graduate fellow, Laura – much thanks!). Our conversation yesterday focused my thinking around the particulars of the relationship between Cognitive Presence and the Practical Inquiry Model, which Garrison explores in Chapter 5. Garrison noted that practical inquiry dates back to Dewey’s writings on reflective thinking, and that practical inquiry is closely aligned with critical thinking – a desired outcome of any educational process. As we talked, I was finding myself somewhat befuddled by the discourse, so I said let me draw it out on the board. 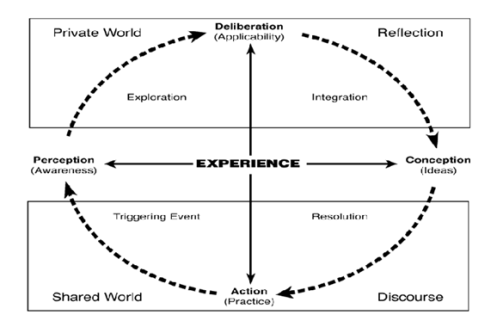 I ended up with the familiar Venn diagram, but with the four aspects of practical inquiry – trigger event, exploration, integration, and resolution – residing within Cognitive Presence. Others then began to morph the drawing, with some suggesting a fluid animated vision or shifts of the circles for gears…with social presence and teaching presence as drivers for cognitive presence. Searching around my laptop as the conversation continued, I found an article of interest published by Karen Swan, Randy Garrison, and Jennifer Richardson in 2009 – “A Constructivist Approach to Online Learning: The Community of Inquiry Framework.” In this article, Swan and team lay out a table with the three presences, categories within each, and indicators. Swan noted that much of the literature to date had focused on the role played by each presence rather than a holistic look at the interplay of all three together. She noted that not only does the influences shift between them, but they also shift over time within a course and beyond a course. 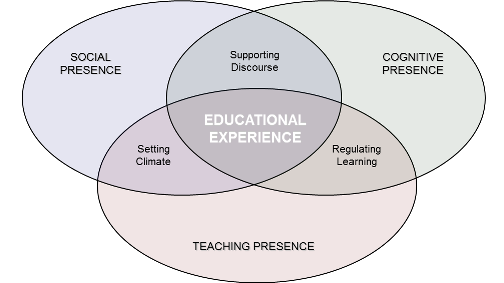 The “learning” might kick in two to three courses later as continued integration and resolution occur. This idea fit with our discussion. 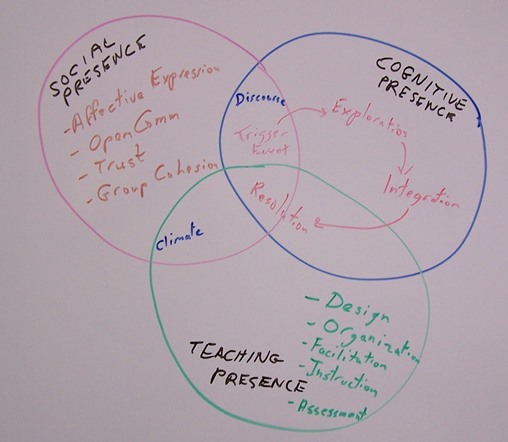 In an online course, a blog post and resulting commentary for instance could be evidence of social presence, cognitive presence, and teaching presence all interacting together. We are going to continue to tease this out in our discussion next week, with everyone reading the Swan article. After the discussion yesterday, I found another article from the good people in the SUNY Learning Network. 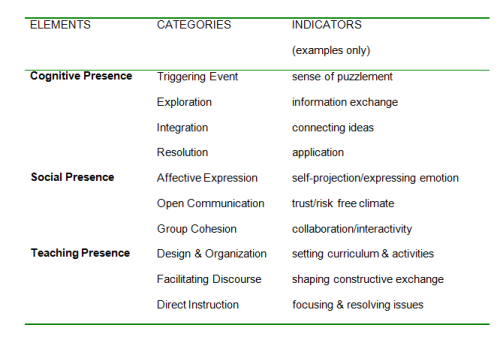 In “Learning Presence: Additional Research on a new conceptual element within the Community of Inquiry framework“, Peter Shea and eight colleagues suggest that “learning presence” should be incorporated into the existing framework, adding the element of learner self-regulation to the mix. Laura noted that she had seen more recent articles that pushed back on this concept…so we have some additional research to do for next week! Speaking of next week, I have signed up for another MOOC on Creativity, Innovation and Change. Looks promising…and I like that they have three levels of involvement – Tourist, Explorers and Adventurers. I plan to achieve at least Explorer…and may rise to Adventurer! I understand that more than 100,000 have signed up…and the map of participants is exciting! Stay tuned for more on that! Any thoughts on this Community of Inquiry reflection are welcome!